Last year I switched to a cleaner and leaner way of eating. To say it was easy would be a bit of a lie. It wasn’t the easiest thing in the world for me because living in Oklahoma clean eating isn’t not very popular. Fattening, greasy huge portioned food, that’s what’s popular out here. I have always been a huge salad lover so increasing my intake on those wasn’t an issue but eliminating almost all dairy was not fun. In additional to cutting out dairy I also gave up sugar, red meat (which I wasn’t a big fan of anyways) and after a while I started steering myself towards a vegetarian diet. The hardest part for me was finding recipes that were 1) healthy 2) looked good 3) kid friendly. You can laugh now, I am. This is seriously not easy to find. So I do what every normal person does when in search of something….scour the internet. One site I came across was 100 Days of Real Food. Hello instant love. Not only is the site gorgeous but guess what it’s a real person behind it! 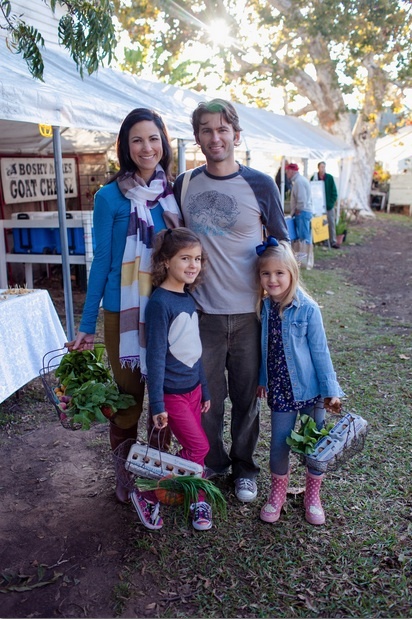 Lisa Leake is wife, mom to two of the cutest little girls ever and she creates some amazing, good, real recipes including one of my all time favorites (I’ll get to in a minute). On top of having a hugely popular website Lisa found the time to write a recipe book. Now it’s not just your normal recipe book. In addition to her recipes she also goes in to great detail about what real food really is, tips on shopping for real food, how to implement changing your eating habits to switch to real foods and she even includes budgeting tips! I really love that the recipes included are not out of this world recipes that no one can make because they call for ingredients that you have to special order and are to out there for kids to even try. They’re recipes we all grew up with and love and family friendly. Like homemade chicken noodle soup, carrot cake with whipped cream-cheese frosting (oh my yum), pulled pork, ribs and sooooo much more. One of my favorite foods to eat is anything Italian. Even just the basic pasta and sauce? You can’t really go wrong there. I swear in my past life I must have been an Italian. The only thing I don’t do is sausage, other then that I will devour it all. And when I say devour I mean seriously DE-VOUR. There’s something about that type of food that is comforting, filling, satisfying and just plain delicious. 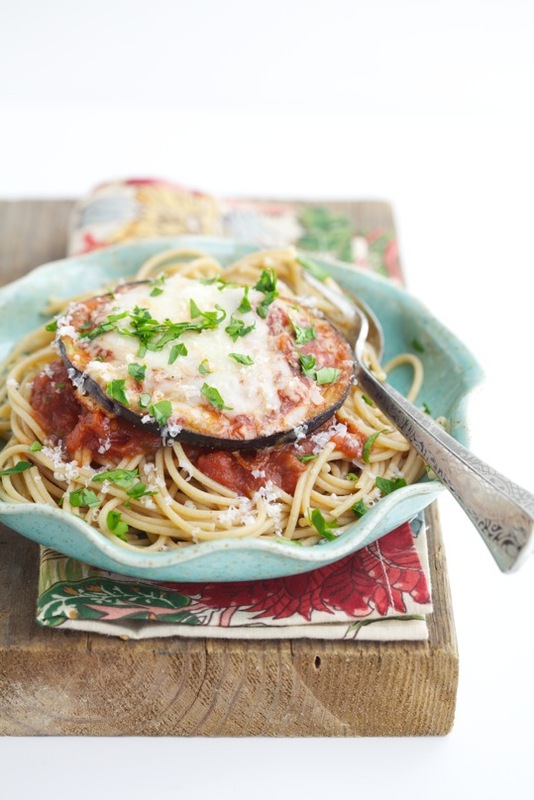 Enter Eggplant Parmesan….I’ll wait as you salivate over this for a minute. Eggplant Parmesan has to be my all time favorite Italian dish. Going out to eat can be very costly and while I do enjoy eggplant parm in a restaurant it doesn’t always agree with my stomach since cutting back on dairy. Two years ago I wouldn’t have had a problem, I would have drooled at the amount of cheese they throw in between the eggplant and I would have added more cheese once it was put in front of me. Cheese, as delicious as it is, isn’t always wonderful in large quantities. And that’s one of the things I love about Lisa’s recipe from her new cookbook 100 Days of Real Food. The eggplant Parmesan has just the right amount of mozzarella on it. Just enough to give the flavor but not enough to drown the flavor of the eggplant or make you regret eating this meal. 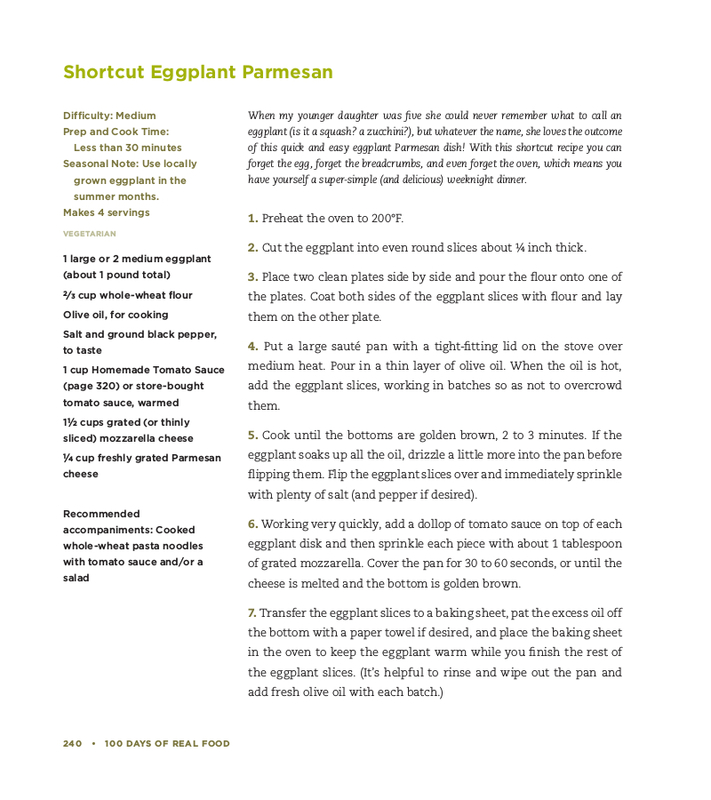 And because Lisa is so awesome I get to share a sneak peak of her book here with you and since I am raving on and on about her Eggplant Parmesan dish what else would I share. If you are food lover like me but want to go the cleaner, healthier real food route I highly recommend checking out Lisa’s book 100 Days of Real Food. At Amazon it’s under $20. It’s a great investment in getting yourself and your family started on a healthier life style. I really liked your current post regarding the 100 days real food. I wanted to know about the some new grilling food. Will you share with us? 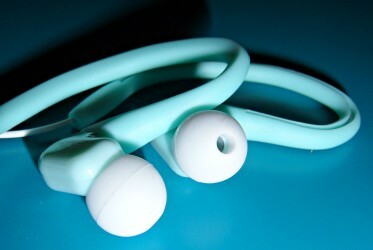 One thing I’ve always struggled when listening to music with earbuds, especially while I exercise is keeping them in. I have what we shall call odd shaped ear canals. One is actually smaller then the other and the other is slightly turned. I may have just revealed way too much information about me and it’s totally gross I know, but hey it makes me unique. On the downside finding ear buds that fit me is not as easy as it is for others. Recently I was introduced to Koss and I will try not to gush too much but it will be hard because I am in love! First let me introduce you to the FitBuds. They are offered in five different colors, purple, blue, coral (pictured below), lime and mint. 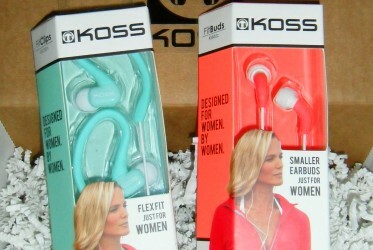 They are 33% smaller than any other earbud Koss has ever created. They are also sweat resistant and the elements are completely surrounded by a dual-injected, soft-rubberized housing so they will fit perfectly in the female ear. Each set of FitBuds also comes with three different sizes of ear cushions so you can pick and choose your perfect fit. And these are the FitClips. These are also available in the same colors as the FitBuds. 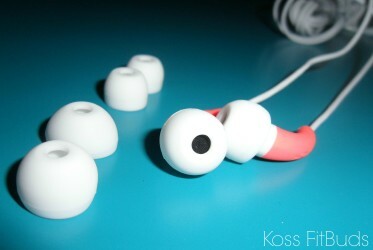 The main difference between the two is the flexible over the ear design which allows you to “clip” the buds to your ear. They too are also 33% smaller, sweat resistant and also come with three different sizes of ear cushions so you can pick and choose your perfect fit. I am still trying to figure out which one I love more and honestly? It’s a hard decision. They are both awesome and I keep rotating between the two. I’ve even worn them while cleaning the house (which I may or may not do some dancing while I clean) and they didn’t fall out a single time. 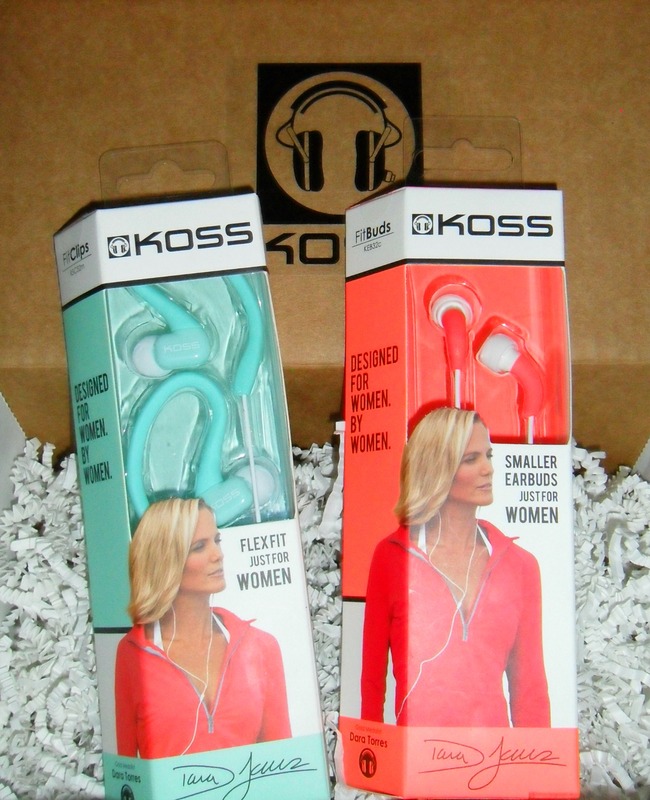 If you are in the market for a new pair of earbuds, are an active woman, or looking for a present for the active woman in your life, you should definitely check out Koss FitClips and FitBuds. 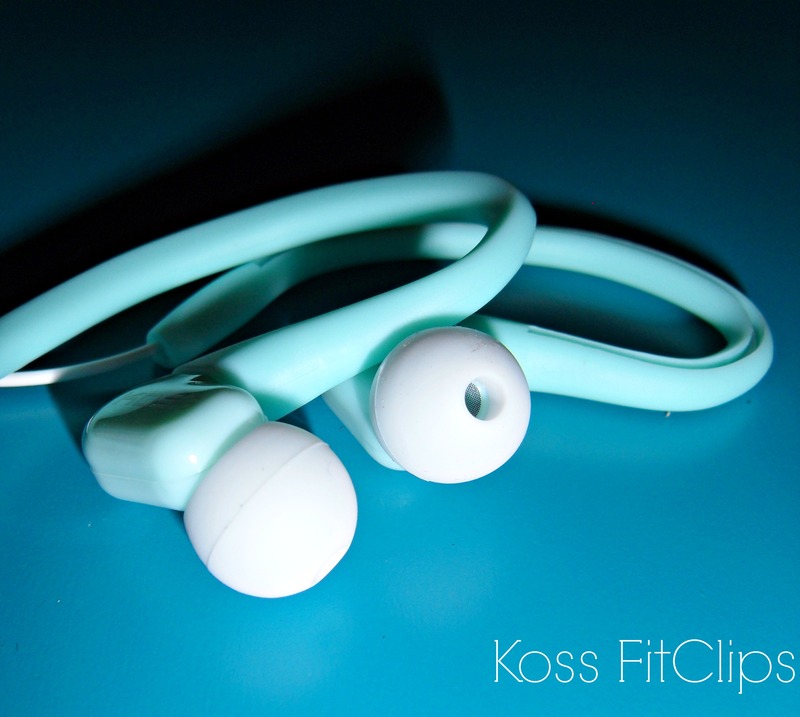 Right now you can snag yourself a pair of Koss FitBuds and/or the FitClips for $19.99 for the holidays at retailers such as Best Buy, Wal-Mart, Walgreens, Sears, and Kmart. But be quick, after the holidays they will go back to their regular price of $29.99. I plan on picking up a pair for my sister who is the runner in my family. If you’d like to learn more about Koss be sure to check out their Facebook, Twitter, Instagram and Pinterest pages. I love everything about salads. I love picking out the ingredients that will go into them, creating new twists on a classic, and discovering new flavors that will work together. I truly just enjoy the whole process of preparing them…and of course eating them. A salad is always better when you use bold flavors. Keeping things mild is relatively boring so if there is an option to go bold or go home…I go bold. 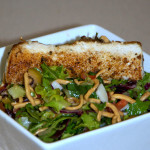 When I received two boxes of Organicgirl greens the other day I knew immediately what type of salad I was going to make. With the bite these particular greens offer I knew it would pair perfectly with the light taste of Mahi Mahi with an Asian type of dressing. 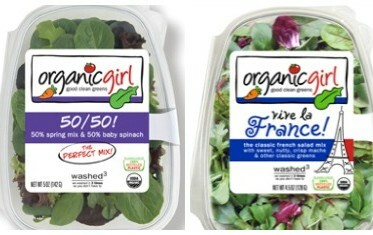 Organicgirl vive la France contains a variety of lettuce such as mâche rosettes, baby chard, baby arugula & radicchio. It varies depending on the season but I personally love the flavors of this mix. Organicgirl 50/50! is a mix of baby spinach, baby green romaine lettuce, baby red romaine lettuce, tango, baby red oak leaf lettuce, baby green oak leaf lettuce, baby red chard, baby green chard, lolla rosa, arugula, mizuna, tatsoi, baby green leaf lettuce & baby red leaf lettuce. 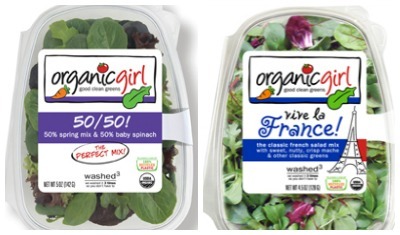 I have only seen Organicgirl offered at one of the stores local to me but one is better then none right! To learn more about Organicgirl: Good Clean Greens, you can visit their site here and follow them on Facebook and Twitter. 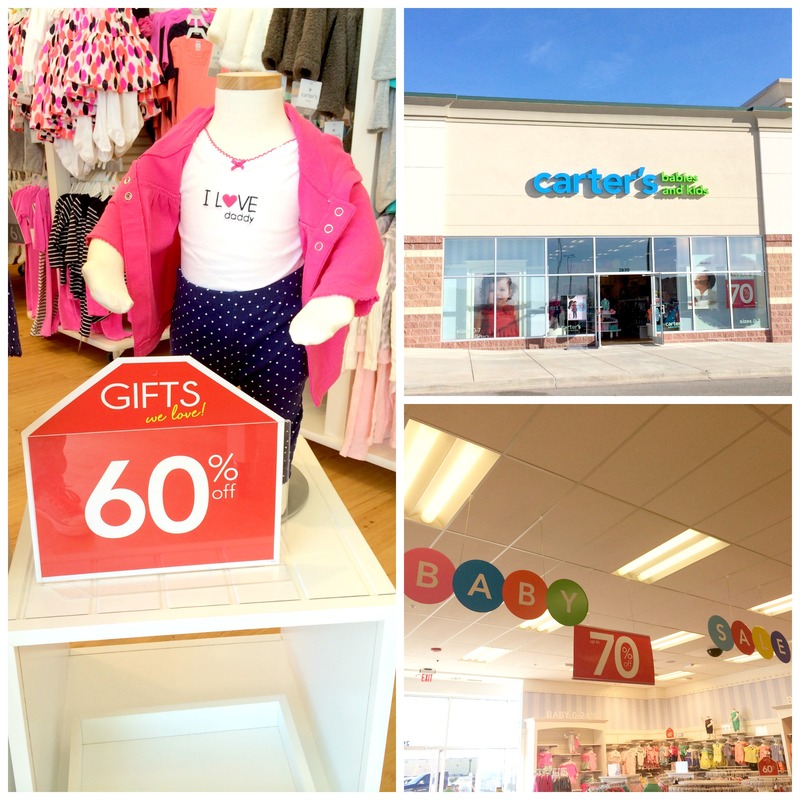 You can also search their site to find a retailer that carries their line in your stores here. 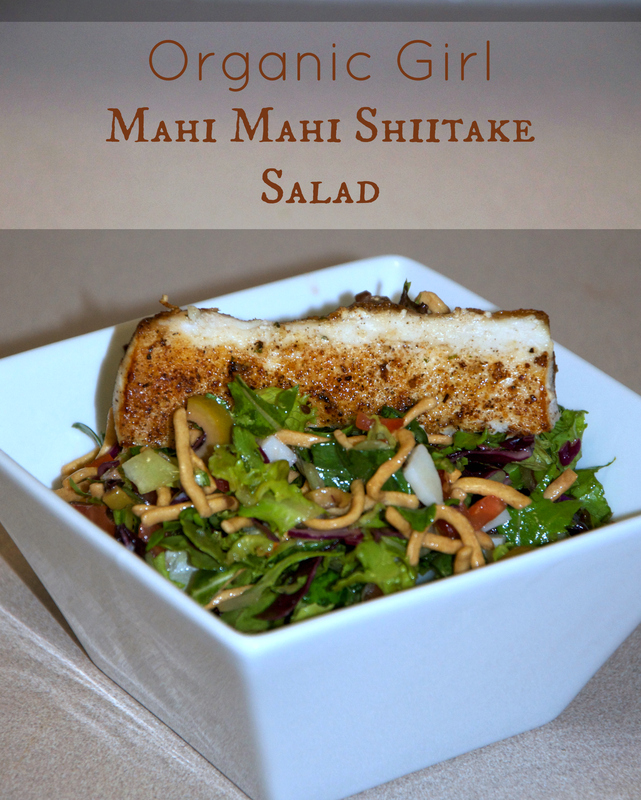 Mahi Mahi only take a few minutes on each side to cook prepare your salad prior to cooking the fish. When your fish is cooked through place it on top of your salad, squirt with a bit of lemon and top with the Shitake Sesame dressing. Oh yummy yummy, I need to try this, I', rather boring when it comes to salads, but not anymore!!! Thanks Shana. I was provided an ecode to facilitate my review. FINALLY a fun interactive family friendly iPad app for children! Seriously I cannot tell you how long I have been on the hunt for an affordable children’s app that my kids will enjoy using and actually learn something from. Yeah there are tons of non education apps out there for our children but finding a truly educational, fun, and interactive app is not as easy as it sounds. Let me introduce you to Agent Magic Investigates Punky Dunk & the Goldfish by FamLoop. My daughter drew those strawberries in this screen shot. Agent Magic is the cute little mouse (you see him on the screen n the pictures above) who takes you through the story and all of the interactive parts to the app. Consider him like your guide through the story. Let me name off a few things my daughter and I love about this app. 1. It keeps the kids attention! 2. Recording the kids voices so they can hear their answers…pure genius. I think that may be one of my daughters favorite things about this app. 5. The app brings the kids into the story instead of just reading the story. My absolute favorite part about this app? Everything. No really combine our list above and that is why I love this app for my kids. By bringing the kids into the story and making them a part of it you capture their attention and bring out their imagination. FamLoop refers to this type of story telling as dialogic reading. When I first saw that I had no idea what it meant so I looked it up. The definition of dialogic reading is “Making reading a story into an interactive experience by asking simple questions and talking about the pictures in a storybook”. 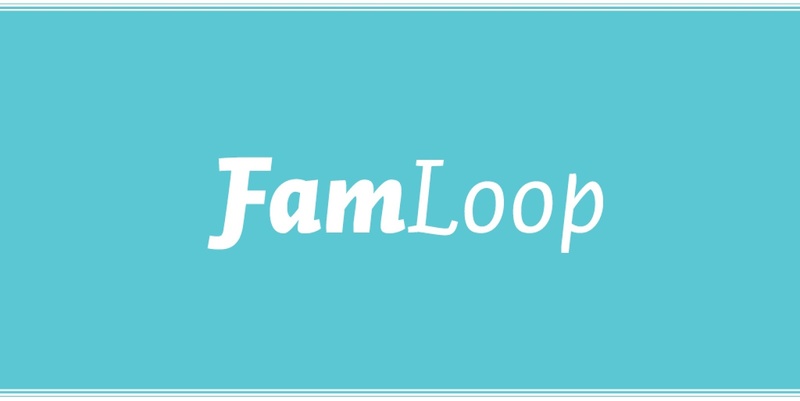 FamLoop does this perfectly with Agent Magic Investigates because where other apps may ask the questions, heck even children’s shows do it (Dora the Explorer ring a bell?) with Agent Magic Investigates the kids get to hear themselves after they answer the question. This may not seem like a big deal but for little one’s knowing they were heard and being acknowledged, even if my an electronic device is big, especially while learning! 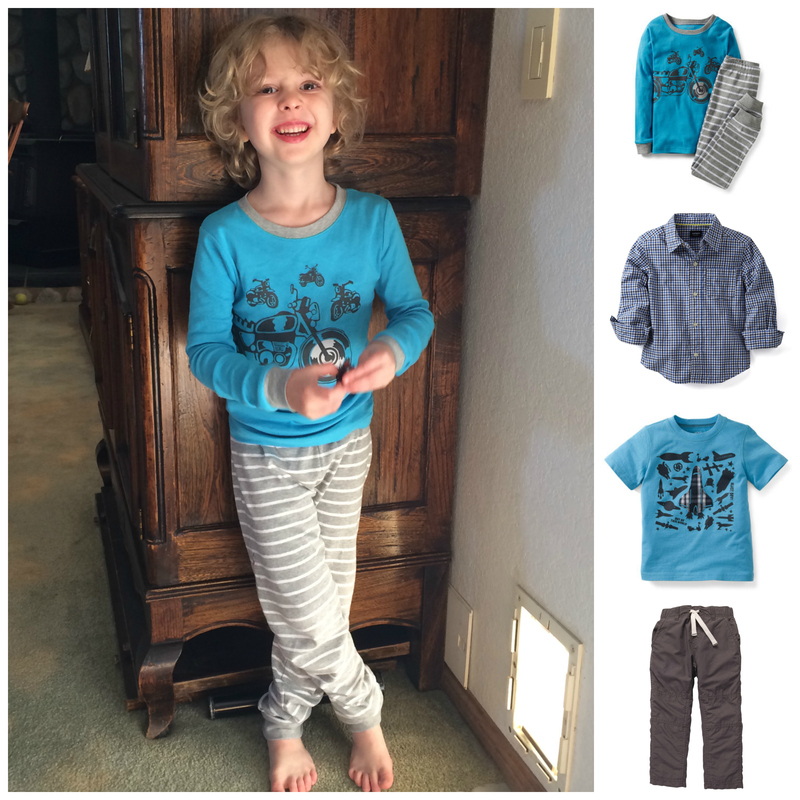 My final thoughts….at $2.99 this app is a steal and a must have for your children. My five year old and my six year old both love it so I think it’s safe to say between 4 and 7 is a good age range. There are so many beneficial things to this app that I and my kids love that I think any child that loves to learn will love as well. Technology is something we use every day as adults, whether it be a cell phone, a tablet, a desktop PC or a laptop, most of us will use at least one these throughout the day. We use them in front of our kids therefore it is a part of our childrens lives as well. I encourage you to allow your children the opportunity to use these divides as well but more for the learning experiences as opposed to games with no educational value for them. Disclosure: I was provided I was provided an ecode to purchase this app to facilitate my review. No other compensation was made. All thoughts and opinions stated above are my own. The other week my daughter and I had the honor of attending a pre Grand Opening event at the See’s Candy in the Penn Square Mall. As soon as I stepped foot into the store I may or may not have done an inner squee. The saying “just like a kid in a candy store” stands true for adults too you know. 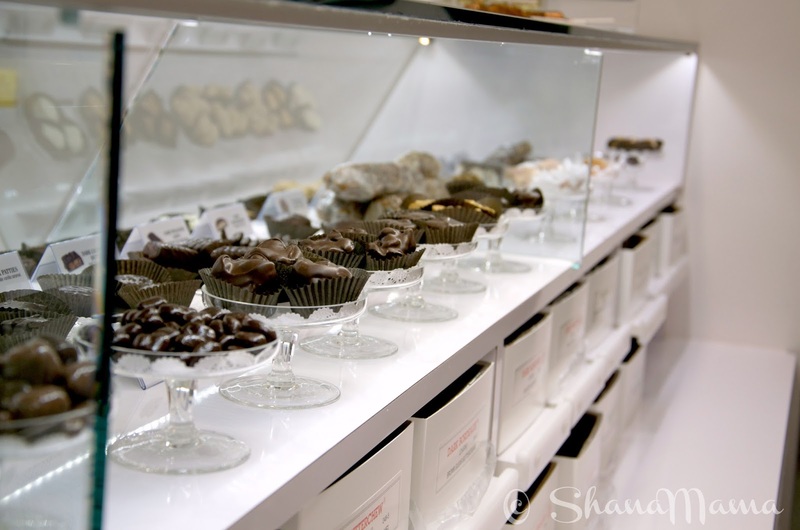 There’s something about stepping into a See’s Candies store and smelling the chocolate (oh my gosh the chocolate) and seeing the classic black and white tiled floors that brings out the inner child in every one. As if they knew what we were all thinking we were given a chance to take a peek behind the counter, and get this, we did packing races! Lets just say I now know how to efficiently (not speedily) pack a 12 count chocolate caramel marshmallow box of candies. It was a lot of fun watching everyone try to figure out how exactly to get the little papers that the candies sit in separated with one hand AND not touch any of the candy with your hands, it was a fun process but also educational in learning that they don’t actually touch the candies and that they actually inspect each box to make sure it is up to their standards before it can be sent out to be sold. 1. See’s sells over 26 million pounds of candy every year! 2. In addition to the 26 million that they sell they give away approximately 1 million pounds in samples. 3. Every single person who walks through the door has the option to receive one sample of candy. 4. The first See’s Candies shop was opened in 1921 in Southern California. 5. They have two factories in California. One in Burbank (which I have driven by so neat) and one in San Francisco. 6. 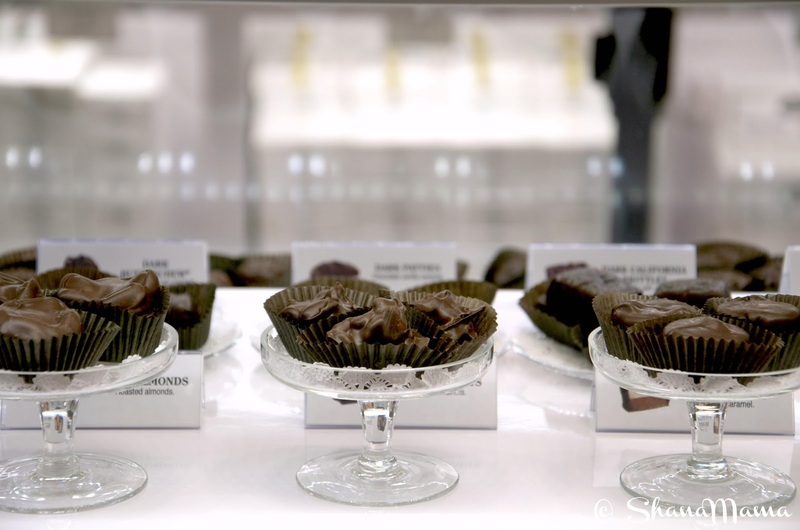 See’s Candies was started by Charles See the son of Mary See who’s picture hangs in every See’s Candies store. 7. They still make a few of Mary See’s original recipes from when she first started baking such as the fudge. 8. See’s uses no added preservatives in their candies. 9. They now offer Gluten Free options. 10. The LollyPops are made in a different factory then the chocolate candies so that along with the chocolate drops are the only candies that they can guarantee are allergy friendly. 11. The chocolate drops is the same chocolate that they cover their candies with. 12. See’s employees are AWESOME! Seriously they pour their heart and soul into their job and love not only what they do but the company they work for. 13. And my favorite little tidbit they shared was that the scene in I Love Lucy, you all know which one I’m talking about right? 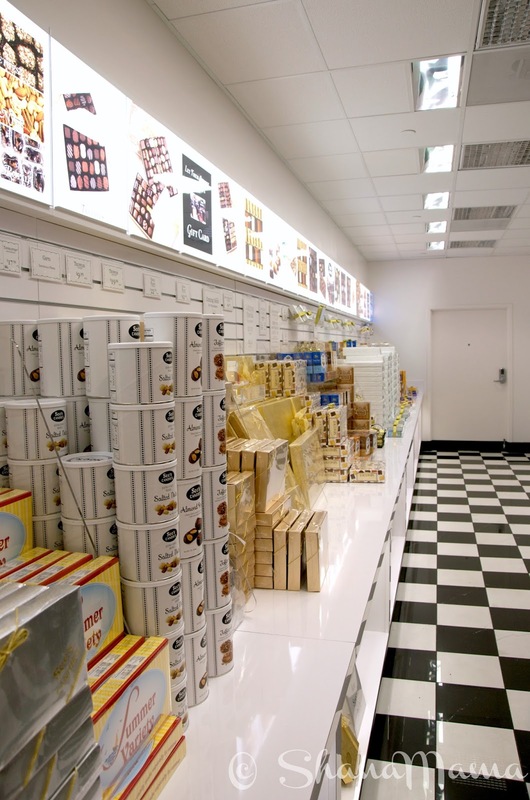 The one where she’s in the candy shop trying to keep up with packaging the candy along the assembly line and she get’s so overwhelmed in the classic Lucy fashion that she starts shoving her face with chocolates? Yeah that one! It was filmed in the Southern California facility. Okay so I learned a little bit more then just a couple of things but it was all so fascinating to me I just soaked it all in. I’ve always been a See’s fan. I still remember going into a See’s store as a little girl and walking out with a chocolate LollyPop in hand. I want to personally thank Adam, Jermaine, Diana and See’s for allowing my daughter and I to take a peek inside the magic behind your wonderful company. I love paranormal. Seriously madly deeply truly LOVE it. There’s something about it that just grabs me by every fiber of my being and takes me away to this far away land and holds me there. Then I finish the book and it’s back to reality. Always a sad day when I finish a book. I know I can’t be the only one who gets completely sucked into a book like this. If I am then you guys are reading the wrong stories! Today I wanted to introduce you to a friend of mine’s newest venture….Dark Dawn. The author, Melissa Brodsky is made of pure awesome, seriously she is. She writes such engaging stories, I used to stalk her site for her short stories and she’s such a sweet heart. Melissa together with Nicole Andrews Moore created Dark Dawn. Here take a peek into the story. Are you grabbing onto the edge of your seat? Yeah I was too. So imagine my excitement when I was approached about doing a review AND a giveaway. I’ll get to the giveaway in a minute but first let me gush about the book. One thing I loved about this book was while I may have had a hint of what was going to happen, I really had no clue and was proven wrong. That to me is always a huge deal in a book. You always want to keep your audience guessing. If you have a story that is too revealing then you wont keep the readers attention and they’ll never finish. The version I read was the MA version and while definitely adult it wasn’t so hot and heavy that it took away from the story line. It was very tastefully done. In fact it may have been closer to PG compared to some of the paranormal romance novels I have read. It was a refreshing change. The characters…I really truly madly deeply love the idea that the main characters are angels. Not just people who have wings and fly but REAL angels created my the holy man himself. Along with being immortal, strong, and equipped with beautiful wings, each angel had their own power if you will. More of a gift bestowed upon them. Each gift fits the character perfectly and made the character into an individual as opposed to just this group of angels with no depth. I don’t want to give away to much of the story line but I don’t want to close with the fact that while the book may not have had a cliff hanger ending (THANK YOU…seriously not a fan of cliff hangers lol) it left a few things open and unanswered to lead into the second book of the series, Dark Destiny which is scheduled to be out in 2014. The ONLY downside to that is now I have to wait for it, I am so impatient when I find a series I love. Oh well at least I will have something to look forward to right? 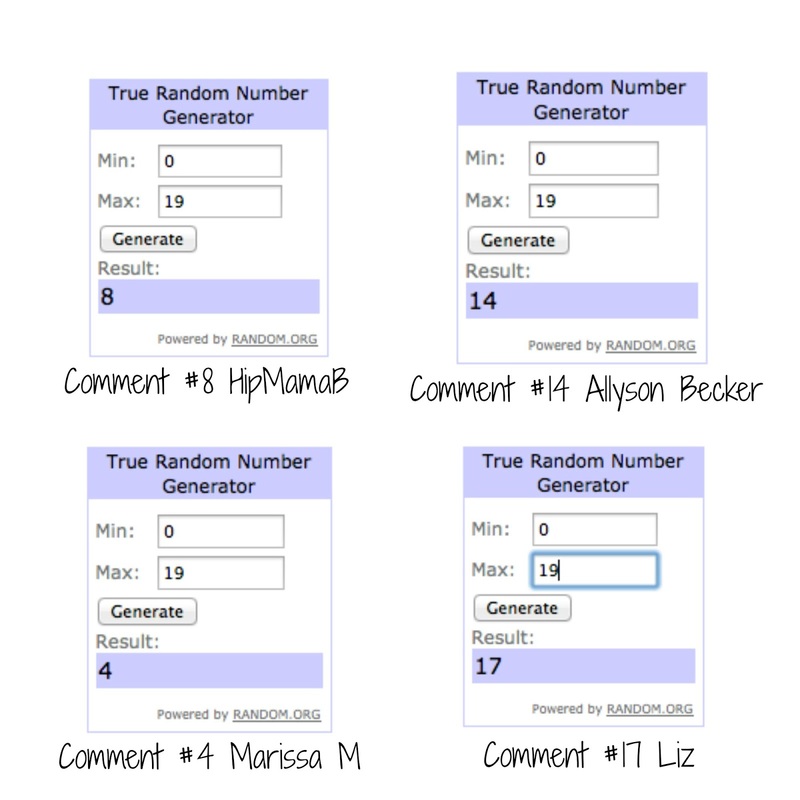 And now on to the giveaway I promised! 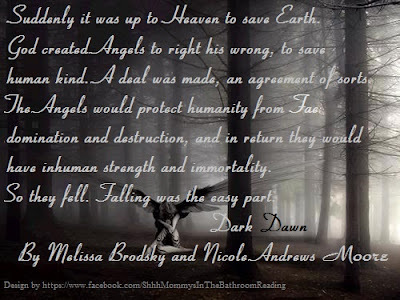 I am giving away four ebook copies of Dark Dawn to FOUR of my readers! Since Dark Dawn is only available as an ebook right now please make sure you have some form of reader prior to entering this giveaway. I’d hate to have someone win who has no way of reading the book. There are four possible entries for this giveaway. Please do the mandatory entry prior to the additional entries. This giveaway will be open until July 7, 2013 July 14, 2013 at 11:59pm and is open to US residents only. Based on the info above what are you most excited about reading in Dark Dawn? 3. Tweet about this giveaway. Make sure you come back and leave a link to your tweet! Quick note, if you aren’t into Adult stories this book is also available as an NA Version here. 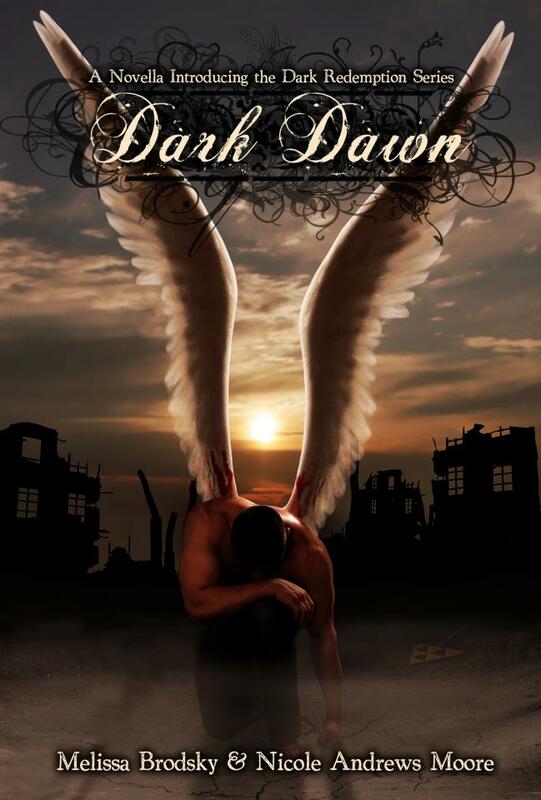 Also make sure to keep up on the latest news regarding the Dark Dawn series….like when they second book is going to be released and possible teasers on their Facebook page! I was provided an advanced copy of this book in order to facilitate my review. No monetary compensation exchanged hands. All opinions stated above are solely my own. I am providing the copies of the ebook all on my own for the giveaway simply because I love the story and want to share it with others. UPDATE….I will be extending this contest by one week since I am having issues with my move to WP and my site was down for a few days. I apologize for the inconvenience this may have caused for anyone attempting to enter this giveaway. The new end date will be July 14th at 11:59pm. 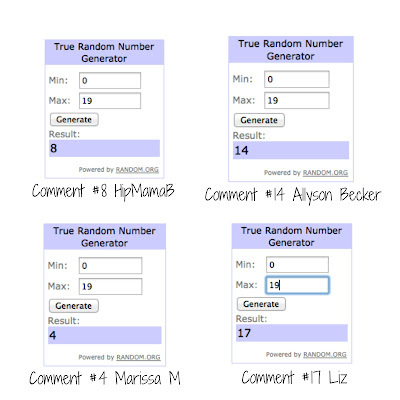 Winners are posted below and have been contacted. Thank you to all that entered! Monsters University 3D in theaters now! Disclaimer: I received a complementary pass to see this movie with my family, I was not paid to attend the screening or to write this post. As always, all opinions expressed are my own. 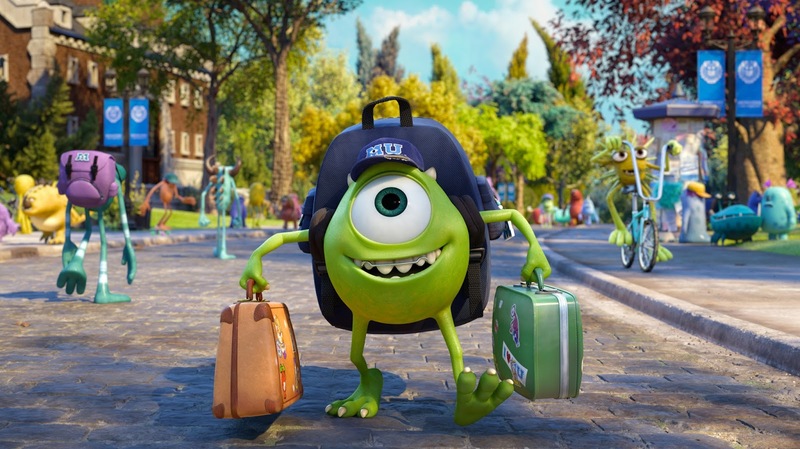 Monsters University finally hits the theaters today! 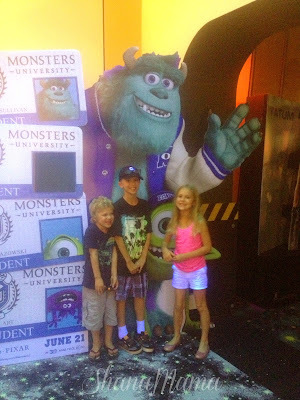 The kids and I attended a screening of the movie last week and let me tell you something, I haven’t laughed that hard at a animated movie in a long time. 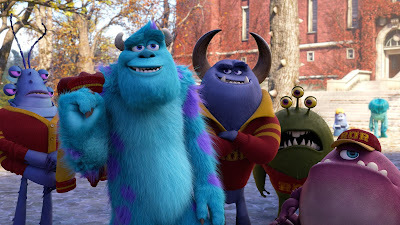 Actually seeing Monsters Inc. may have been the last time so it was fabulous to see that even though this was a pre-qual to that they still made a family friendly, heart warming yet comical movie. I’ve professed my love for Disney many a times but dude really they are amazing. To pull off those three qualities in a single movie is a great feat. Ever since Mike Wazowski (voice of Billy Crystal) was a little monster, he had one dream….to become a Scarer. 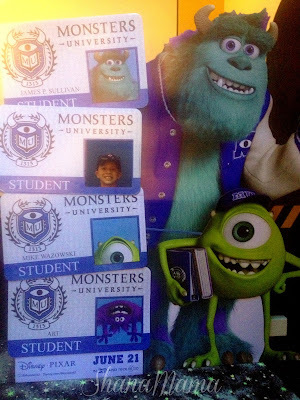 Now a college student at Monsters University he tries harder then any other monster there to prove his worth and show everyone there that he is the best Scarer. But not everything goes as planned. 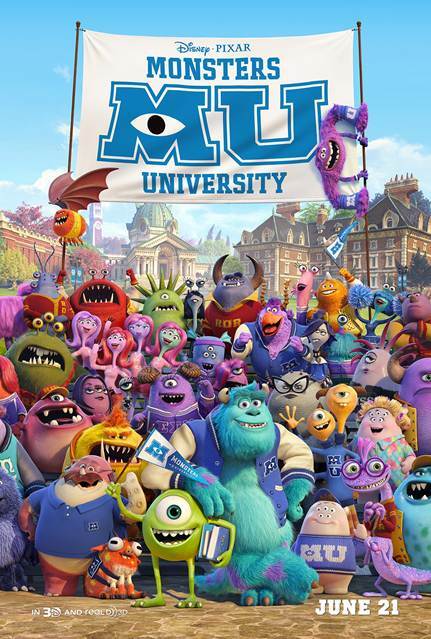 During his first semester at college Mike’s plans go awry when he butts heads with hotshot James P. Sullivan, Sulley (voice of John Goodman), a natural-born Scarer and son of the famous Phil Sullivan. 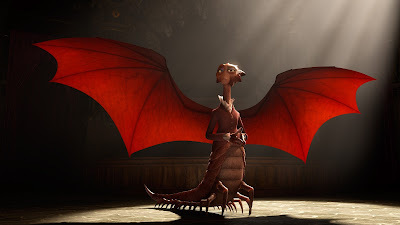 Dean Hardscrabble. Totally scary looking and for a second I was worried she might have actually scared my kids but she’s not all that scary deep down, she may even surprise you. The “underdogs” Oozma Kappa aka OK. This group of characters were hilarious both as individuals but even more so as a group. Mike and Sulley’s competitive nature ends up getting them both kicked out of MU’s Scare Program. As if that wasn’t bad enough, to add salt to the wound they realize in order to try and get back into the program and prove themselves worthy they will have to work together with a group of underdogs. It’s a wonderful story of acceptance friendship, values and character. In short I absolutely recommend this movie for both kids and adults and Moms beware there is a scene or two that may tear you up a little bit. 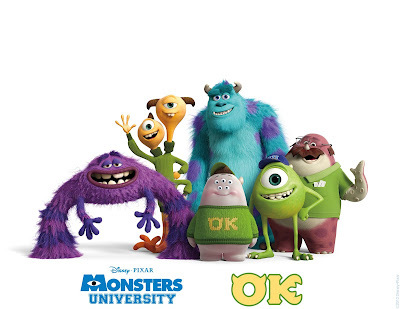 You can follow MU on Facebook at facebook.com/PixarMonstersUniversity as well as Twitter at twitter.com/disneypixar. In February we added a new member to our family, Theta. The cutest little runt Beagle you have ever seen. She is a handful, one I will admit, that I was so not prepared for. See I have never had a dog on my own. I guess I did it backwards. Most people have plants, then dogs then kids. Me…I kill plants and had three kids young, then for some reason I decided we should get a puppy since the kids are a bit older. Fast forward three months and here we are with our soon to be six month old insane active puppy. When we adopted her the office mentioned getting her chipped and I immediately cringed. You mean like a chip implanted in her skin, that kind of chip? Yeah sorry that would be a no thank you. I just can’t agree to chipping an animal. So when I was approached about reviewing a non invasive pet tracker I couldn’t say no. 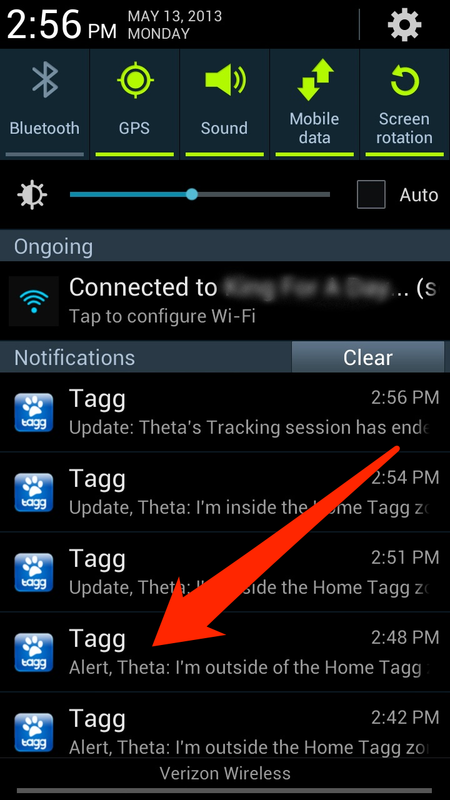 Tagg is a tracker that attaches to your pets collar. It is easy to attach and remove. There are three components to the tracker. Two of them attach together for you to slide onto your pets collar and then main piece (the tracker) then snaps into the other pieces and locks into place. To remove simply press the button on the each side of the tracker and it will unlock. Now to the tracking part. We all know accidents can and will happen. A perfect example happened this past Friday as I was leaving to take the kids to school. We were all climbing in the car when all of the sudden my oldest starts yelling NO NO NO. Me thinking something bad happened I jumped out of the car and ran to him asking what what…what was wrong? To that he ran to the fence where our dog was halfway through this nice little hole that I had no idea was there. If my son haden’t noticed her she could have gotten out and who knows what would have happened. The only thing I can think of is 1) thank god she didn’t get out and 2) I am so glad we have the tracker if she had because then I could have seen where exactly she was. 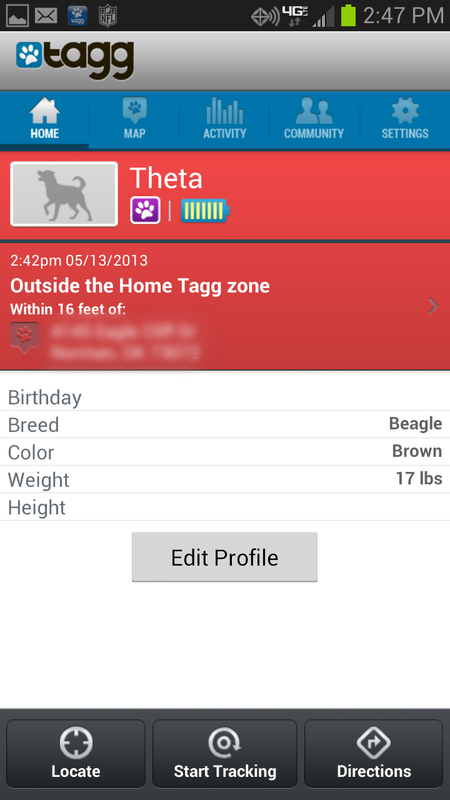 The Tagg tracker uses GPS to locate the exact cordinates of your animal at all times. That alert was sent to me via text and as a notification directly through the app so there was no way for me to miss it. When you click on the alert it will open the app and show you the last location of your pet similar to this. You can also view the map version as well. We have since covered the hole in our fence but if this were ever happen again I have the piece of mind knowing that I could still find our littlest member of the family no matter where she may roam off too because through Verizon Wireless the Tagg uses GPS and 4G LTE wireless technology to track your pet’s location from your mobile device. And of course part of the fun part about the app is that you can share information from the app about your pet on your favorite social networks. Gotta love technology right! This device is works exclusively with Verizon Wireless devices and you can download the app for free directly from their website or via Google Play or through iTunes. They love hearing from people on twitter and are always quick to respond to questions and/or concerns! Disclosure: I received a Pet Tagg from Verizon Wireless to facilitate my review along with a Samsung Note to access the app. No other compensation has been given. My opinions, as always are my own.